World Time Buddy : Excellent look and feel and also has add-on for Chrome which makes using it very easy. World Time Buddy (WTB) is a cross between a world clock, meeting planner and a time zone converter; a true productivity booster for working with world time. Carefully thought out design lets it effortlessly convert between time zones, plan and schedule conference calls, online webinars, international meetings and even track Forex market hours. WTB was born out of frustration with existing meeting planners and time zone conversion tools. Optimized for ad-revenue, most of them have forgotten about delighting their users. One can ADD LOCATIONS (OR REMOVE, SET HOME, ORDER), MOUSE OVER HOUR TILES TO CONVERT AT A GLANCE, CLICK HOUR TILES TO SCHEDULE AND SHARE and CREATE FREE ACCOUNT TO SAVE SETTINGS. The other alternative is 24TimeZones. This has a very good look and is interactive and can help you to find out the time - if you don't know the exact city name in an interactive fashion by showing a world map. 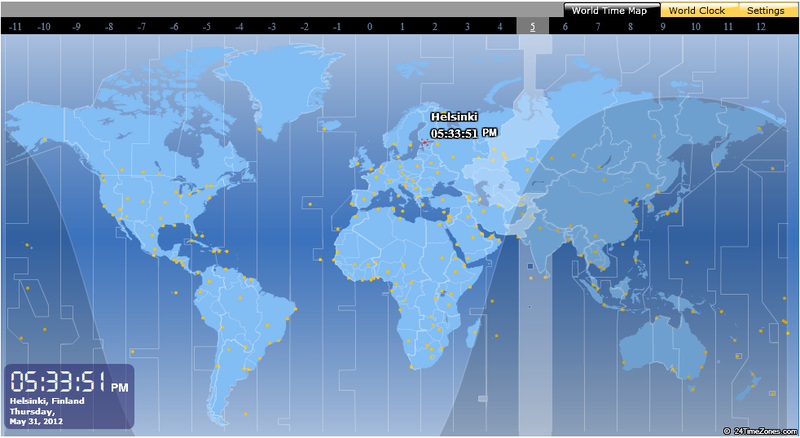 Flash Map of World Time displays current local time in any place around the world right now. 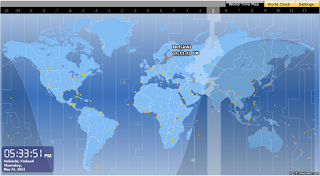 World Time Clock & Map is an indispensable utility for everyone who deals with people abroad or anybody who is keen on knowing what time it is further than locally. This advanced Flash application is very helpful for travelers who need to know time difference around the world and want to be aware of world time zone they are traveling to, as well as for businesses which are located in different time zones and want to know current local time of their partners and customers. Just click on “Settings” button on the top-right of the map and discover how you can customize the map yourself! New features like the ability to add more clocks and set alarm time were added recently and general usability was improved. Furthermore, we have developed brand-new Flash Time Clocks for Europe, Australia, Canada and United States, making time check even more easy! Interested in having your own fully functional Flash World Time Clock & Map? Visit Downloads section of this site for more information. Do not wait. Enjoy the total knowledge of current time around the world! Given different options we have - my bet is on WTB. Because it is a cross between a world clock, meeting planner and a time zone converter. And a lot can be done beyond just checking time.